Midol is a drug manufactured by Bayer Healthcare to help women alleviate the symptoms of premenstrual syndrome; PMS symptoms include cramps, bloating, fatigue, backache and headache. Five different varieties of Midol are available over-the-counter. In addition to the standard Midol Complete, Bayer offers other Midol products that provide extended and nighttime relief. One formula is designed specifically for teens. Midol Liquid Gels are offered as an alternative to the standard caplet form. Pamprin, manufactured by Chattem, is another medication designed to relieve PMS symptoms. You can choose from four Pamprin varieties: Pamprin Multi-Symptom, Pamprin Cramp, Pamprin All Day and Pamprin Max. 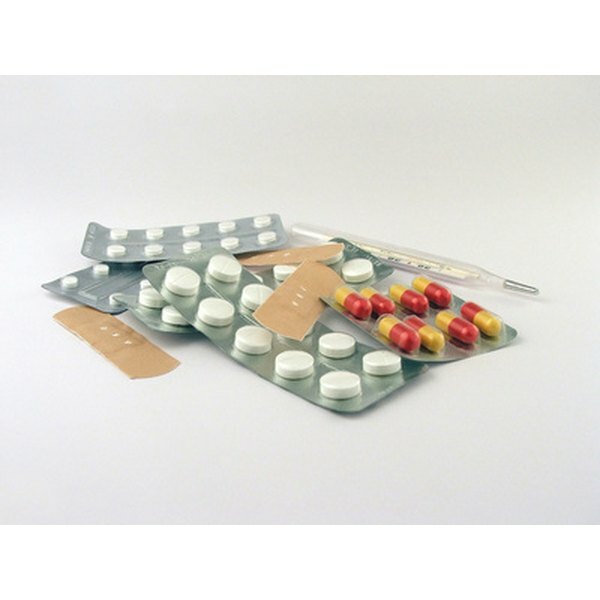 Each product contains different combinations of pain relievers, fever reducers, antihistamines and diuretics. All these products, except Pamprin Max, are caffeine-free. According to the Pamprin website, you should take each dose with a full glass of water. Adhere to the dosage instructions on the label unless a doctor provides other instructions. You can purchase Pamprin at most grocery and drug stores. The active ingredients in each Midol product are a combination of pain relievers and diuretics. Acetaminophen serves as the pain reliever in three of the five Midol products; naproxen sodium and ibuprofen appear in the other two products. As an alternative to Midol, you can simply take a pain reliever or fever reducer, such as acetaminophen, ibuprofen or aspirin. Aspirin and Ibuprofen have anti-prostaglandin effects that can prevent cramping if taken in advance. Midol also contains caffeine to act as a diuretic and a stimulant. Diuretics help to flush water from the body and reduce bloating, while stimulants provide energy and focus. A cup of coffee or tea would provide a similar benefit; these beverages also contain caffeine and act as diuretics. Many women prefer not to use medicine to treat their PMS symptoms and instead use natural, home remedies to provide relief. Vitamins and supplements are often taken to relieve symptoms. According to the Stanford University Sexual Health Peer Resource Center, a magnesium supplement taken every day can restore magnesium deficiencies that are linked to PMS. Calcium can also help to relieve some symptoms. Vitamin B6 and dandelion root can reduce bloating and improve circulation to the female organs. Other PMS remedies include taking a hot bath to relax the muscles, drinking a glass of red wine or a cup of tea, eating a diet rich in potassium, eating small, frequent meals to stabilize blood sugar and getting plenty of exercise. The University of Maryland Medical Center website suggests that herbal remedies such as chaste tree extract, black cohosh, evening primrose oil and St. John's wort may also help relieve symptoms of PMS.